I consciously connected to music when I was about 16, but my intertwining with music occurred later, beginning a little before I turned 18. Certainly within a few years I became intricately lost in it to the point that I realized the truism once stated by Mike Manumission (host of a big club in Ibiza) that “if you keep finding that you’re the last one at the party, that’s a sign you should be the one throwing the party.” This has over the years taken the form of working sales for an underground music label and dance music distribution company, DJing, producing and hosting musically based events (nightclubs), composing and producing music and being a music journalist. Even though I’ve made music, I’ve done so with no musical training or practice on a traditional instrument as such. And so watching my kids both engage with music through school is just the sort of thing, IMHO, that parenting is about. That is, adding to the traits, strengths, etc that your kids inherited from you with things you didn’t get or have the benefit of. In my view, this works best when it isn’t forced on them, and so it is that both kids have independently chosen to participate in music and carry on with it. Big yay! It’s like watching a part of yourself do the thing, or maybe closer to a VR experience of the thing they’re doing since the thing they’re doing is thing beyond your own actual experience. It’s the thing you would be doing, could be doing but for circumstances. The beauty of it is that your extensions–they get to do it, are doing it and that’s just why kids exist–are had at all. In short, it’s quite thrilling, life-affirming and great to see, for instance, my kid in the sort of all-school concert like I did some days ago and at which these pictures were taken. 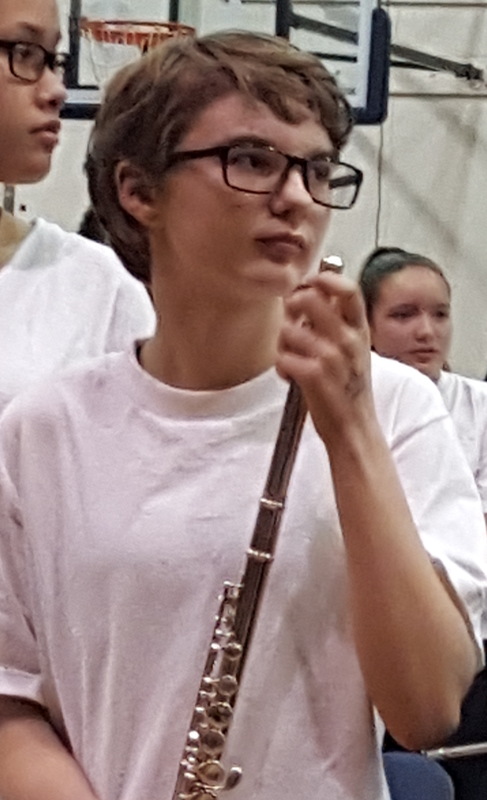 She’s 13, now, and has been playing flute for two years. They sounded genuinely terrific.